Welcome to Kaweah-River.com. This website is an informational resource designed to help the California white water rafting community learn more about the Kaweah River. The Kaweah is a demanding Class IV+ river; our mile-by-mile guide as well as the river description, river flow and river access pages will equip you with some of the information necessary for planning a trip on this challenging river. The camping information and Sequoia National Park page will help you get to know the unique areas surrounding the Kaweah River. Flowing through the small town of Three Rivers, California, the Kaweah is a technical Class IV+ white water slalom of tight chutes and powerful hydraulics. The river flows out of the 13,000-foot peaks of Sequoia National Park into Terminus Reservoir in a short twenty miles. This makes the Kaweah drainage one of the steepest in the United States. Because of this creek-like quality, rafting the Kaweah takes precise maneuvering skills and an active paddling crew. Mistakes have consequences. 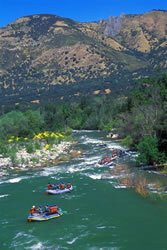 This is why many people opt to raft the Kaweah River with an experienced California white water rafting outfitter. 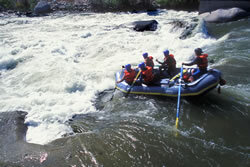 Images courtesy of All-Outdoors California White Water Rafting.